The first time I went turkey hunting, my good friend Russ served as my guide and wild turkey caller. He took me scouting before the spring season in 2015. 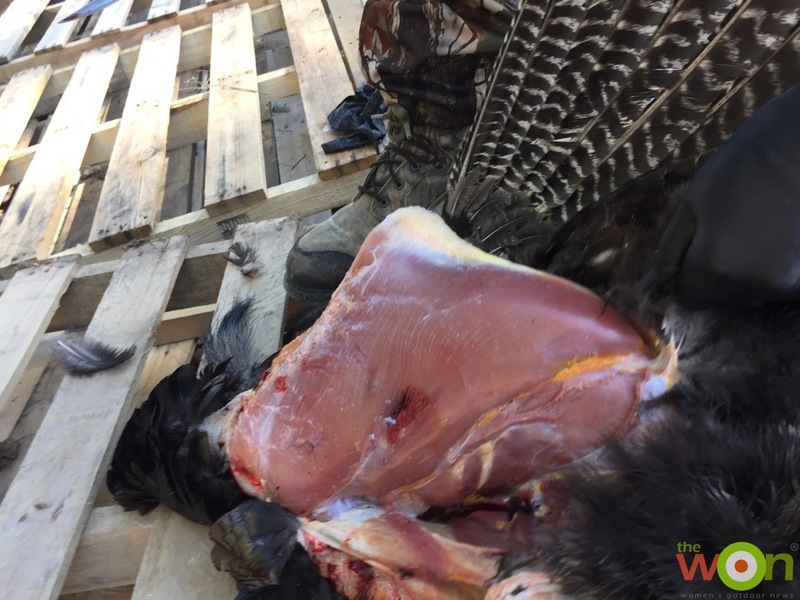 We talked about turkey feeding and mating behavior, and how that affects the hunt. We tried a few different calls as we scouted, seeking that gobble that would indicate we were in the right place for a successful hunt. He shared stories of hunts in the years past and encouraged me to keep hunting even if we had no turkey encounters when we went into the woods. The first day of the season, we had to relocate to a secondary setup after our initial spot yielded gobbles without shot opportunities. After driving to the next town over, we set up in the pines on the edge of a field where my buddy has seen a strutting tom the week before. We had not scouted this location, but my friend had experience enough to feel confident there was a big bird around. After settling in, Russ began his skillful calling on a box call. Sure enough, we heard a strong gobble in reply. The tom answered the next call too, even closer and louder. Russ slowly and carefully called in a 20 pound tom until he walked right across my shooting lane in route to the decoy hens. I sealed the deal at 18 yards with the Remington 870 my friend and guide had used in many previous turkey hunts. It was the perfect hunt, and I am so grateful that my friend shared his time and skills to make it happen! I admit, some of the ways I have eaten wild turkey might make me think like my guide and friend. If not prepared properly turkey, like any meat, can dry out or taste gamey. 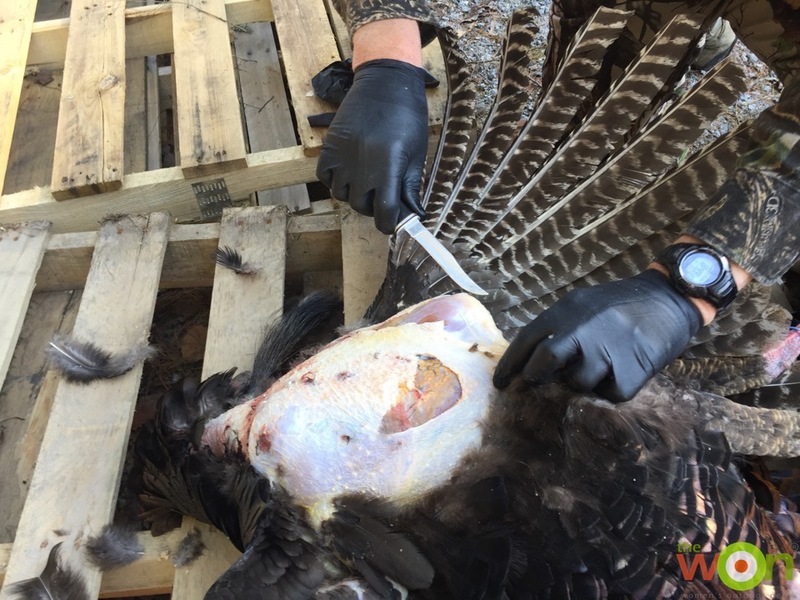 However, after some culinary experimentation with the turkey meat I brought home from both the spring and fall season in 2015, I concluded that there is one secret ingredient that will make any meal of wild turkey taste amazing. And since you’re reading this article, you obviously have a refined palate. I will therefore let you in on my secret. It is as simple as that! 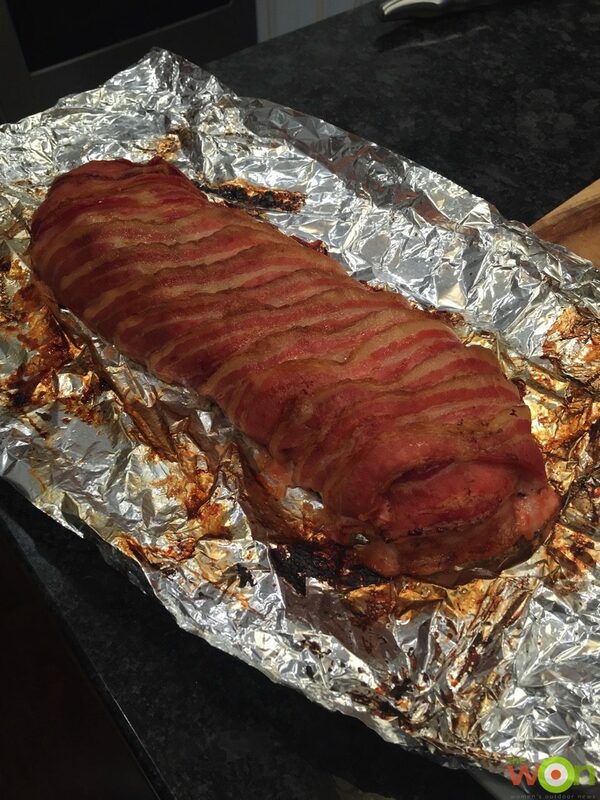 While you can smoke, grill, bake, or stew turkey meat and achieve culinary success with the addition of bacon, my personal favorite way to eat America’s favorite (edible) bird is in a bacon-wrapped meatloaf. When experimenting with my turkey meat, I modified a recipe from The Kitchen Primer by Craig Claiborne. 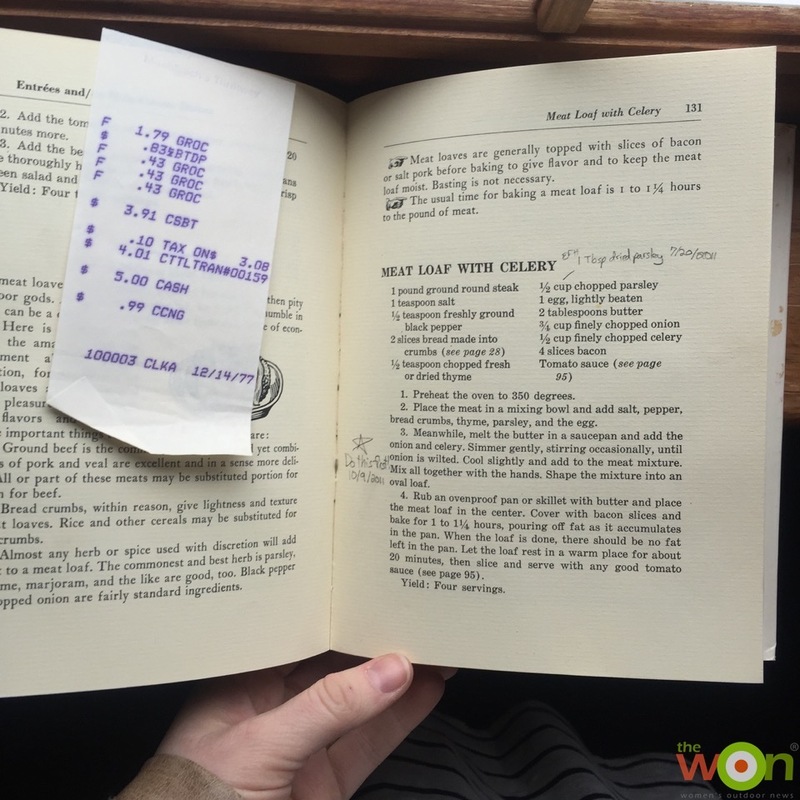 My mom gave my aunt this book back in the 1970’s, when canned veggies at the grocery store cost $0.43 (I have the receipt to prove it!). This recipe is a classic, and it is as delicious as it is fool-proof. A note about grinding the turkey – I used a KitchenAid meat grinder attachment for my stand mixer. It worked great for me. I ground the meat three times. This worked well for two reasons. First, the meat became very tender as it was ground. Second, the grinding process helped me uncover some pieces of shot that I missed in my initial meat cleaning. That was a lifesaver…or should I say, bite-saver. Chop all the things! Finely chop the onion and celery. Also chop the slices of bread then either crumble it by hand or stick the sliced slices into a (dry) food processor. Heat the butter in the skillet over medium heat. Once the butter is melted, place the onion and celery in the skillet and stir. After the onion is wilted but not browned, place it in the smaller mixing bowl to cool. Mix the turkey, beef, bread crumbs, thyme, parsley, and beaten egg in the medium mixing bowl. Once the onion and celery have cooled mix that in too. Line the rimmed baking sheet with tin foil and spray it with nonstick cooking spray (or grease it with butter). Place the meat mixture on the baking sheet and form it into a log. Mine usually is semi-circular, 5 inches in diameter and 12 – 15 inches long. Wrap the meatloaf in bacon. 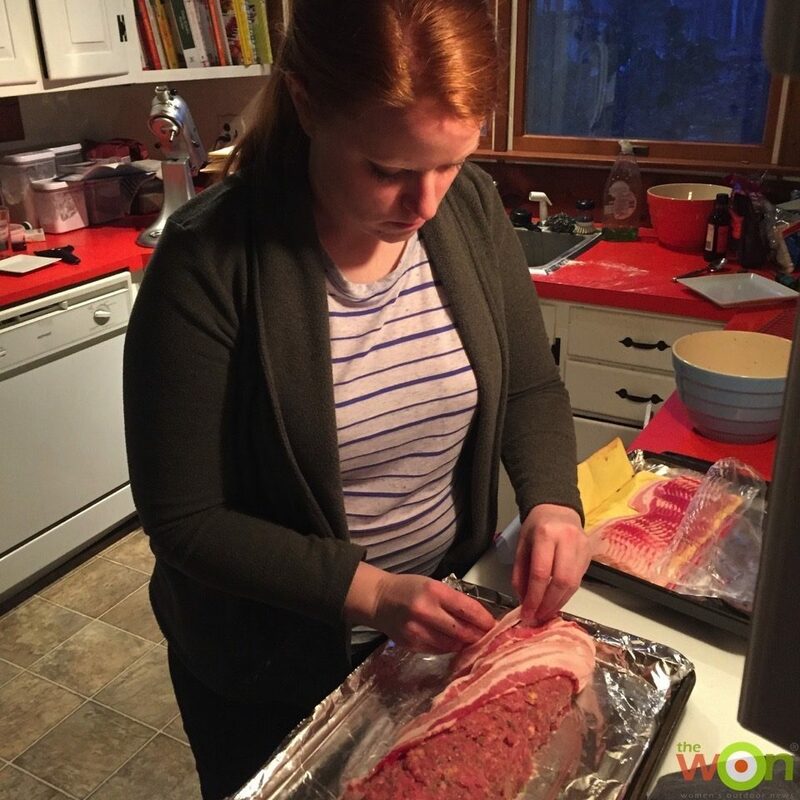 I like to lay the bacon diagonally across the meatloaf and overlap it by 1/3 slice-to-slice. I wrap either end of the meatloaf with a bacon slice and get the ends tucked under the diagonal bacon. Then I tuck in all the loose bacon slice ends under the meatloaf. Make sure the meatloaf is totally covered in bacon, so it doesn’t dry out. Bake the meatloaf in the oven for 75 minutes. I like to start checking on the meatloaf halfway through cooking. Usually I dump the grease from the baking sheet into a glass jar to avoid frying the bottom of the loaf. I will probably do this three times total as it is baking. After the meatloaf is done, I like to let it rest for 5 – 10 minutes before slicing it. Then, share it with friends and enjoy! 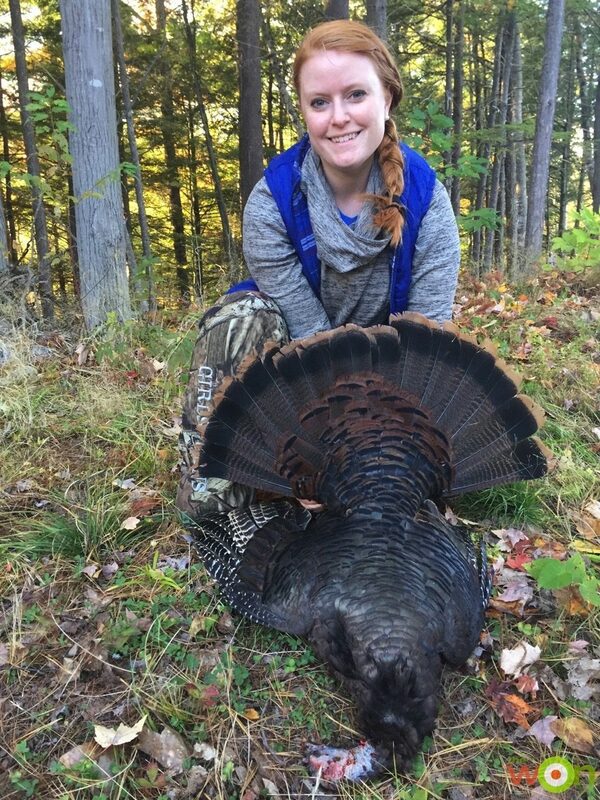 Read some wild turkey hunting tips here.